Jensen Enterprises is Larry's creation and features contract services for City, County and State Building Inspection; Special Commercial and Industrial Building Inspection Services; Construction Project Management Services; Construction Quality Control Services; Construction Safety Officer plus more. All Contract Services are available on a short term or long term basis. Renewable Energy is our speciality. Excelling in Tracking and Stationary Solar Fields. If your City or County has a need for a Building Inspector to cover for an extended vacation, leave of absence or long term illness we can facilitate that with a Term Limit Contract ICC/ICBO Building Inspector. If your company has an employee out for an extended period of time and you HAVE TO GET THE PROJECT DONE; we can help with a Term Limit Contract Project Manager, Quality Control Manager or Inspector of Record. We are just one click away on the contact page. ​Fine Arts and Crafts Division of Jensen Enterprises is Carolie's creative portion of the company. Here she offers wonderful one of a original artwork. My current stock of unique hand crafted artist signed Pine Needle Memory Baskets are featured on this website. All of the baskets are made from oiled pine needles and a wooden or pine needle base, or Gourd Base. Some are embellished with natural stone, bone or metals. The only synthetic item on the baskets is artificial sinew for the thread. 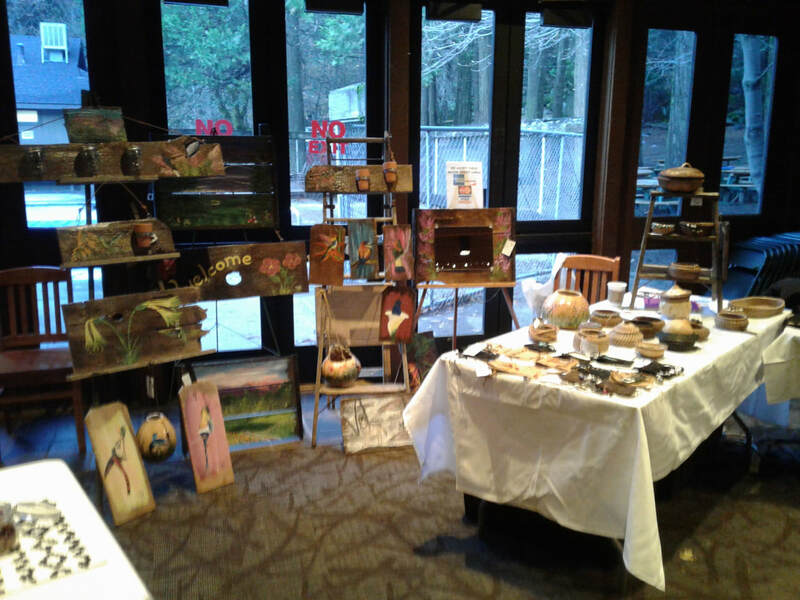 Carolie has expanded into great Wood Plaque, Painted Gourds and Grape Tray Acrylic Original Art Work as well as her normal canvas paintings. We have the Flights of Fantasy Collection, Yosemite Collection, Wild Animal Collection starting with some Great Wolf and Cat Paintings as well as Landscapes and Pictures of places meaningful to Carolie. Carolie is now making beautiful Medicine Bags/Possible Bags out of Deer Skin, Pig Skin, Goat Skin and Cow Hides. Each bag is individually embellished and each is unique. No two are alike. Some are large enough to hold a cell phone. These also make great pouches for LARP players. We also have some belt pouches that are great for cell phones and LARP players. Carolie will make great one of a kind Custom Address Plaques or Name Plaques from repurposed barn wood, you may customize these when you buy them. Be sure to designate if you would like a color other than white for the name or address. We also offer some of the Wooden Plaque Paintings as Wall Hangings with Mason Jars or other containers to hold flowers, lights or whatever your heart desires. Examples of all of these are in the store. All items are available in the website store, including items that are on display at various galleries. We are happy to accept custom orders , quotes will be given on an individual basis. 50% non-refundable down payment is required for all custom orders. ​Please use the contact page to indicate if you would like us to contact you about a custom product quote. Click the Jensen Studios tab to see all products currently available. Check the Calendar section for a full list of places we will be in 2019. We are continually updating our product page and where we will be showing.